I love Management Studio for SQL Server but sometimes it just doesn’t cut the mustard. I had a scenario recently where I needed to revoke access for all users from a database. I could delete them all but that would be more effort than necessary. I just wanted to deny access to a specific database. To my knowledge, there is not a quick way to do this and so I had to write some T-SQL to do it. 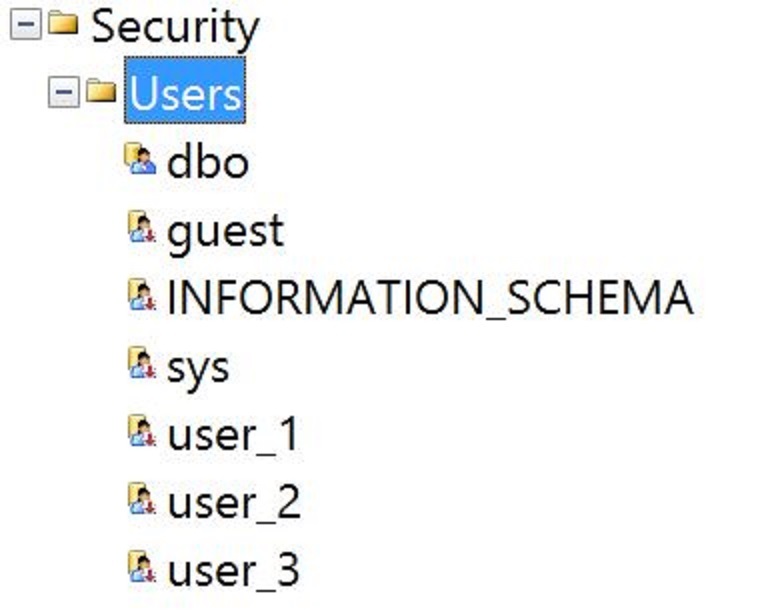 What if you have many SQL Server users and you want to stop all of them accessing the database? Identify them using this query from sysusers. In my case I am using an additional filter to pull out users with a specific prefix. Copy and paste these into a new query and execute them. Test that access has been revoked either by looking in Management Studio or querying sysusers for hasdbaccess = 1 again. If you’re looking in Management Studio at the users, then a red arrow indicates that the user has been revoked. 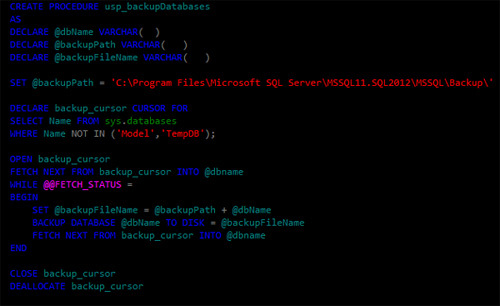 I’ve used this simple SQL Server backup script a number of times to backup sql server to a file or network drive. It’s ideal if you are running SQL Server Express for example which does not come equipped with maintenance plans. 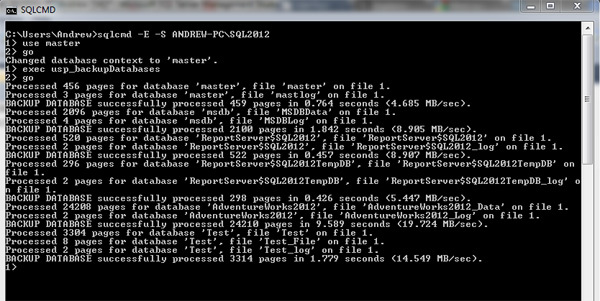 This script can be used in conjunction with SQLCMD to backup SQL Server from the command line. So let’s take a look at this. What we want to achieve here is a way of executing the same backup database command for each database in SQL Server. The “bare bones” T-SQL used might look like this. In this example, I am using my local drive as the backup destination. We can query SQL Server for a list of the databases installed on the instance. You can filter out the databases which you are not interested in backing up. So I get back this list.. I now want to write a simple loop to run through each of these names and execute the BACKUP DATABASE command producing a file on disk. For this, you could use a CURSOR or a WHILE LOOP. I’ll show you both ways. Which one you choose is a matter of preference. Note that by default if you backup to the same file on disk, each backup is appended to the backup file. If you want to overwrite your backup files, use WITH INIT. Refer to the link above for more information on the syntax. Once you have customized the script to your needs, wrap it inside of a stored procedure. Depending on what version of SQL Server you running, you can either schedule this using SQL Server Agent or via the windows task scheduler by calling SQLCMD. Start a command prompt and type SQLCMD /? to get the help options up. Connect to your SQL Server instance using the options available and then run the backup to test that it works ok.
You can set up a windows batch file to call SQLCMD. I could add the following line to a batch file and I am now ready to schedule this using windows task scheduler. SQLCMD -E -S MACHINE\INSTANCE -Q "exec master.dbo.usp_backupDatabases"
It’s important that you get the right plan in place for your server. What I have provided is just a basic script, call it a template if you will. You can customize it to include differential backups, transaction log backups, different file locations, multiple backup sets, multiple files etc. Have a read of the BACKUP DATABASE documentation to get a idea for what is possible. Communicate with the business to agree requirements, write a backup plan and test whatever code you write thoroughly to ensure that it is meeting the backup plan requirements. Backing up using scripts is very handy for editions of SQL Server which do not come equipped with maintenance plans and SQL Server Agent. If you are running one of those editions that does have those features, then you might decide to choose those tools instead. Using backup scripts however still remain highly viable and are preferable to some DBA’s. There are a number of uses for the DBCC SQLPERF command. I touched upon one of them in my last post on how you can use the command to obtain information about transaction log growth. This handy little DBCC command has been around for a while now. So lets look at the others ways you use it…. Looking at each use case for DBCC SQLPERF in turn…. There are newer ways to do this by reading from sys.dm_os_wait_stats but it can be used to obtain wait statistics from your SQL Server. I wrote about waits stats and wait types in an earlier post so have a read of that if you want to know more about them. This resets the wait statistics data that your SQL Server has collected since it was last restarted – very handy for performance tuning. Latches are internal resource locks and wait data is recorded in a similar way to wait type data. To clear out the latch waits that your SQL Server has collected since it was last restarted then run this command. Finally, in order to get log space data on how large your transaction logs are and what percentage of them is in use then execute this command. My last post was about this dbcc command, you can view that here. In order to run this command, your user needs VIEW SERVER STATE permission on the server. 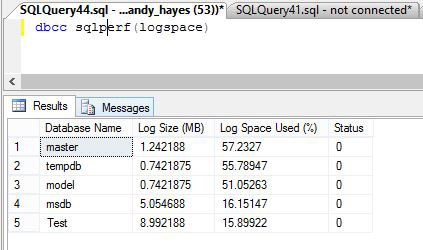 For this article, I am using DBCC SQLPERF(logspace) to get size information about the transaction logs. I hope you will find this post useful in helping to monitor the growth of your transaction logs. The idea here is to capture and store the growth information at set intervals. 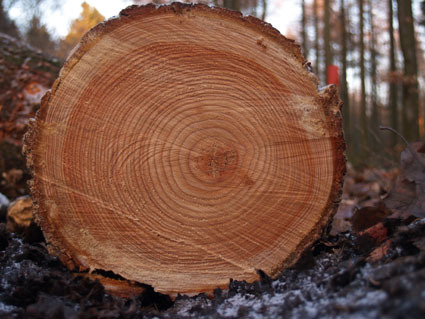 This can provide a way to report on how much the logs are growing by and when. Reports are then delivered by an automated process. The output is self explanatory where for each database you can see the size of the transaction log and how much of it is in use currently. So this is useful information on its own and even more useful if it can be captured on a regular basis and reported on. So I wrote some T-SQL to do this and wrapped it up inside a stored procedure. Firstly I will create a table to store the output of DBCC SQLPERF(logspace). Now this is the bit where we capture the output. Now run the code and then have a look at the data in your new table and it will look very similar to the output from running DBCC SQLPERF(logspace) to screen but with a couple of extra columns for the primary key values and the date that the data was inserted. The LogDate values are obviously very valuable enabling you to report on the data within any date range. So lets say I wanted a report made available each day which gave me a comparison between yesterday’s and today’s growth, you could write something like this having the data collector running once a day. Providing that you are running a version of SQL Server that is able to send email then you could deliver the report via this method. This example has attached the output as a text file but you can also format it up nicely as HTML if you want to. Once you have the code written, it could be scheduled to your preference. As I mentioned, this example is to run daily and compares yesterday and today but you could run it hourly if you wanted to and then write some T-SQL to analyze the hours of the day when you get the most growth. You could write daily reports for the whole week, something to report on the month etc. It could be a great report to help with capacity planning. 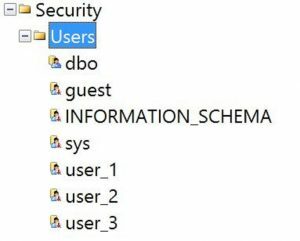 In order to deliver this, you could send the report by scheduling with SQL Server Agent, an SSIS package, Reporting Services or SQLCMD called from a batch file using windows task scheduler.